From Portage Lake, Finney Lake can be reached via a 300 m portage which begins just across the lake from the camp. An aluminum boat is cached at Finney, but take seat cushions / PFDs, a paddle, fuel, lunch and cold drinks along. Spinning outfits and a basic selection of lures are best for Finney Lake bassin’. Finney Lake is the best of the 2-species back lakes, boasting a wonderful mix of “numbers” and trophy bass – smallmouths to 5 lb. and largemouths to 6 lb. 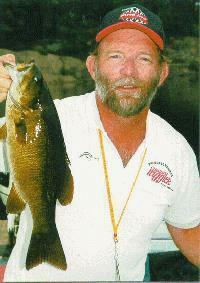 Finney Lake is a long, narrow and very diverse lake offering excellent fishing for both smallmouth and largemouth bass. This long, narrow, clear-water lake has many small back bays with excellent shoreline cover (weeds, blowdowns, rocks) and numerous beaver lodges. Fishing a 3 or 4-inch plastic craw or 7-inch worm at the edge of the weedlines or at the base of beaver lodges is sure to put anglers onto Finney Lake bass – fish averaging 1-1/2 to 2 pounds, with some bass topping four pounds. Beyond Finney Lake, Deep & Little Deep Lakes are accessible via portage.